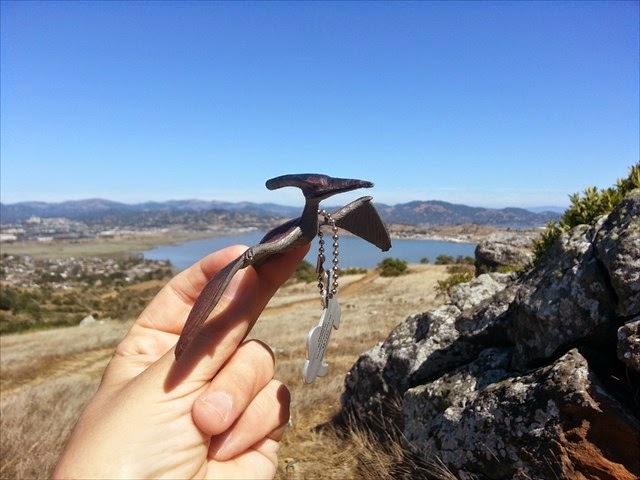 Back in January, I reported that my Travel Bug, Taco Pterodactyl had gone missing. 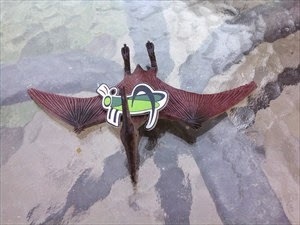 If you want, go back and see Missing Taco Pterodactyl? On December 31th, this geo-cacher said "good-bye" to my little Taco Pterodactyl and dropped him off at "Want a Steak, Want a Shake, or will you get Gas?". On January 5, a log on this cache says, "Nice cache no trackable inside tho". I contacted all the people who had logged visits to that cache between the time Taco entered the cache and the time he was reported missing. I got answers from 4 out of the 6 saying they had not seen the poor little guy. The other 2 never answered. I had no choice but to consider Taco MIA. But, then ... he popped up briefly in February on the geocaching radar with a "discovered it" log on his web page. "We´ve seen this TB on my first nice event in Florida the FFF X. Thank you for sharing. Kind regards from Germany says Purzelmännchen and merlin3468"
That was at least encouraging, but with no location, he was still technically missing. Finally, toward the end of March, someone found him and properly picked him up. Not sure how long poor Taco sat there on the cold, wet ground alone as he was never logged out of his previous cache. I will be sure to move him along." Since then, two separate geocachers have been logging visits and dropping him into Florida Geocachers. Taco is officially back in the game. He is currently sitting in a cache called The Geo-Mazing Race: Olympics - Wrestling. Hopefully the next person to pick him up will probably log him and keep him moving. 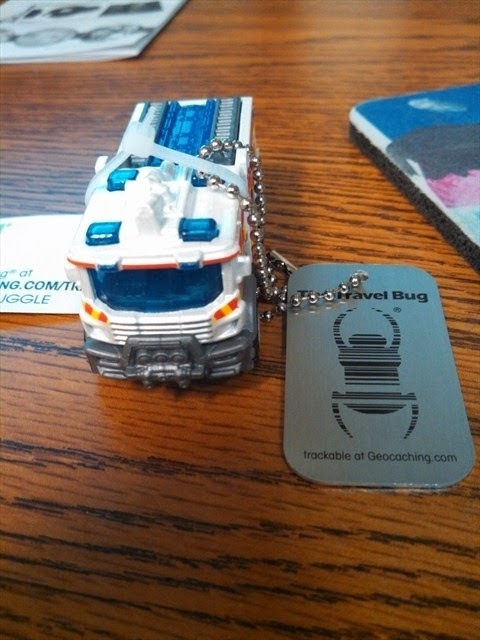 Taco is my second oldest travel bug, and until recently, the oldest one still surviving. He has traveled a total of 11,277 miles. He has gone across the United States. See his map here: http://www.geocaching.com/track/map_gm.aspx?ID=3060405. Just for some perspective, my second most traveled bug has gone only 2,450 miles. Although, Search & Rescue is in another country (Quebec Canada), and has been active pretty recently. That is also pretty cool. Anyway ... I thought I would let you know that Taco is not lost anymore. I'm sure you are thrilled to know it. I'm glad too. I would like to see him get out of Florida. I was thinking about changing his "goal" to get back to Colorado, but maybe I should try to get him moved toward Wisconsin. Of course, most people don't actually read TB goals, so it probably wouldn't do any good. The Bluefields are heading to Florida again next winter. If he's still there, maybe I can get them to pick him up. Kind of doubt it, though. They come along with the rest of us, but are not really the geocaching type. Winter is a long way away. Even if Taco is still in FL at that time, the state is big enough that he probably won't be close to where they are planning to be. Trying to physically find a trackable is never easy. I can't imagine this would be something they would want to attempt. It would be pretty cool if they could tell him down, though.